INDIANAPOLIS, Ind. 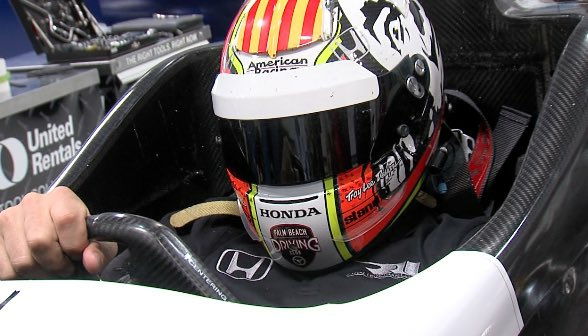 (May 15, 2017) – Veteran driver Oriol Servia, representing the Palm Beach Driving Club, went 220.794 mph in the first day of practice for the Indianapolis 500 on Monday. Servia, driving the No. 16 Rahal Letterman Lanigan Honda, was second fastest in his group behind fellow Spaniard Fernando Alonso. Alonso went 221.634 mph in his lap around the 2.5-mile Indianapolis Motor Speedway, while rookie driver Ed Jones was third in the group at 219.288 mph. It is the second year that Servia is representing Palm Beach Driving Club at Indianapolis. He finished 12th in the historic 100th running of the race in 2016. Palm Beach Driving Club, the pre-eminent members-only club for automotive enthusiasts in the United States, is located at Palm Beach International Raceway in Jupiter, Florida. PBDC offers weekly, year-round track programs to automotive enthusiasts exclusively at Palm Beach International Raceway. With multiple level of membership, the club can tailor a program to fit the driver’s racing skill or automotive lifestyle. The facility is fully lit offering members and guests the opportunity to get on the track, day or night. Palm Beach Driving Club (PBDC) offers weekly, year-round track programs to automotive enthusiasts exclusively at Palm Beach International Raceway. The elite club allows drivers to tailor the program to fit their lifestyle. The club’s membership is made up of drivers of all levels of experience with a desire for practice sessions and races under the guidance of professional drivers. PBIR is undergoing an expansive multi-year capital improvement project that will see new state-of-the-art client hospitality and higher-level lighting developed for night-time televised racing and new club activities as just a few new additions. This year, the road course has hosted large scale corporate programs with Rolls Royce, Lamborghini, Aston Martin, Ferrari, Bentley and Cadillac to name only a few impressive automotive brands now using PBDC and PBIR to host their dealership groups and customers.